The dog collars have a history that goes back to the ancient Egyptian, Greek, Chinese and Persian times. 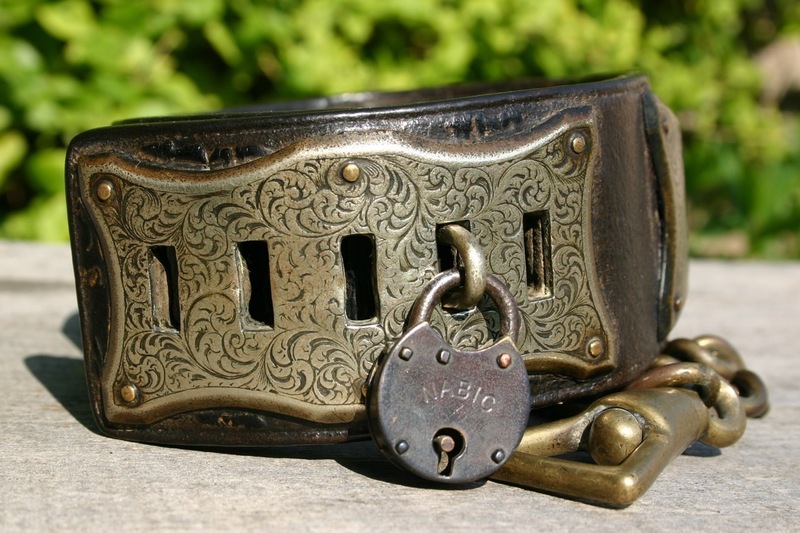 Through the centuries, the relationship between the dog and his owner led to the development of the collars. Dogs and humans have a long history together . Before we kept cows, trained birds and even before we had seen a tiger, humans had dogs as pets . About 12,000 years ago in the old world, dogs were domesticated. We have found out that in those times dogs were buried with their owners ! But when did we start to decorate, to control and identify our dogs? We will follow the emergence of the dog collar from the ancient times to modern times and we will see how our changing attitude towards the animals have influenced the collars. Scientists believe that about 15,000 years ago, dogs were first domesticated in the area what is now the border between Mongolia and China. A range of native Chinese breeds stems from the imperial palaces and monasteries. The favorite animal in the imperial court was the Pekingese, a little lion -like dog that enjoyed all the love and special treatment. 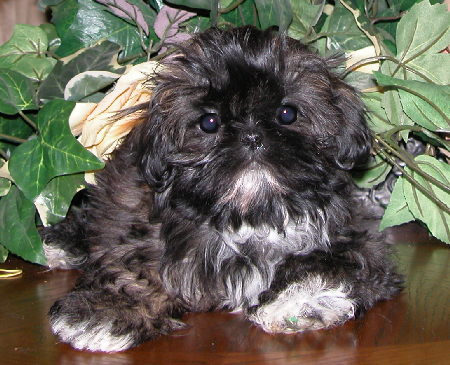 The Pekingese was seen as the companion of the Chinese emperors , who had a monopoly on this breed. For a long time, the Pekingese were held only by members of the Chinese imperial palace. Many unique features have been attributed to these animals. 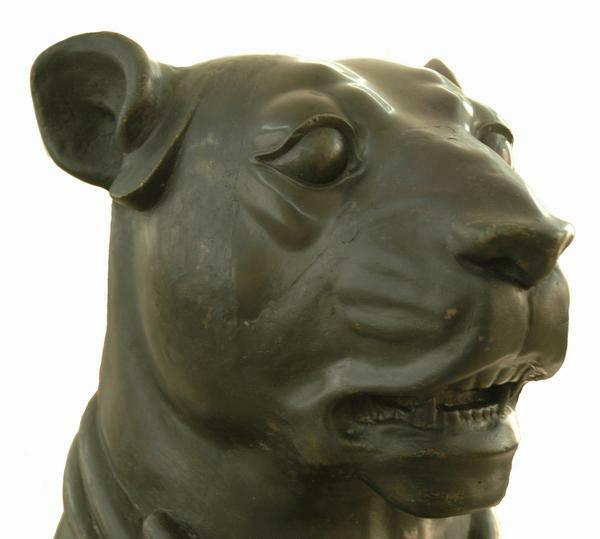 It was believed that these dog brought happiness and expelled evil spirits. There were sometimes up to 200 Pekingese living simultaneously in the palace. The biggest fan of the Pekingese was Empress Cixi who had more than a hundred dogs of this breed. In China, the " Lion Dog " gained status as the official dog of the Imperial Palace. This happened at a time when dogs were on the diet of the local farmers, but anyone who had an imperial dog beleaguered, could be punished by death. Moreover, there is a breed of dog called " Chinese imperial dog " which originated around 700 BC and was used to heat up imperial feet. The Saluki or Persian greyhound originates from the former Persia . The variety name is derived from the Arab city Saluk, that has disappeared under the sand. Salukis were used as hunting dogs by various nomadic desert people and were thus scattered from the Caspian Sea to the Sahara desert. In Persian pottery dating back to 4200 BC, the Saluki dogs were portrayed The Pharaohs hunted with falcons on their wrists and saluki 's on the leash, and mummified salukis were found in Egyptian tombs. Salukis are strongly related to Afghan hounds and are sometimes called Gazelle dog. The Saluki were used both as a hunting companion and as a hunting dog. The ancient Persians had laws that would punish everyone for killing a dog with 500 to 1,000 lashes. Even feeding a dog with bad food could lead to 50 - 200 lashes, depending on the breed and social status of the dog. But when did we start to decorating our dogs with collars ? 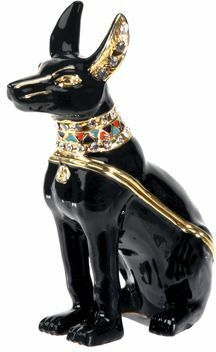 Everyone has heard that the Egyptians loved their cats, but they absolutely also their dogs ! Although dogs at home were less revered, they were more common than cats to appear as gods and symbols. Dogs were not portrayed as pets, but always as hunters and protectors . As happened with the cats, the dogs were mummified along with their owner. The Egyptians had laws governing the ownership and the handling of dogs from the beginning of the Pharaonic era. The wall paintings show that humans made extensive use of animals already in those time, eg. For hunting. Even species that we do not know as domesticated animals today, such as hyenas, were held by the Egyptians . 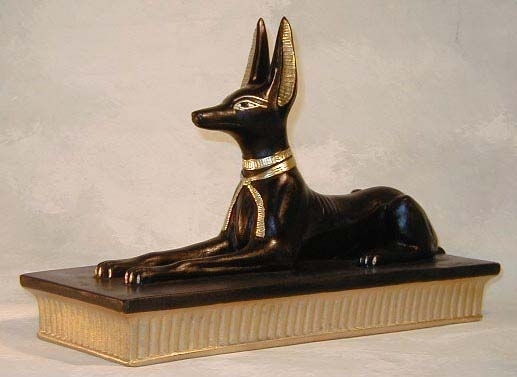 Even some gods such as Anubis, were (partly) the appearance of animals and people were aware of the specific characteristics of animals. In the nineteenth century, archaeologists discovered the so-called 'Dog Catacombs', but only now are scientists really studying the catacombs . With stunning results. The catacombs actually form a labyrinth of tunnels, filled with the corpses of animals. The catacombs are located in the Egyptian desert and are thousands of years old. It has been estimated that they have been built between the years 747 and 730 BC. The first results are stunning. That animals are buried in the catacombs, is nothing new. But the numbers are incredible. Scientists estimate that around eight million mummified specimens are located in the catacombs, mostly dogs and jackals. Most animals were only days or even hours killed and mummified after their birth, according to the researchers. The large numbers indicate that the animals were bred in huge 'puppy farms'. Shortly after the animals were born, they were slain and mummified. And all for the god Anubis, the god with the head of a jackal. The gift of a mummified animal was a pious act. 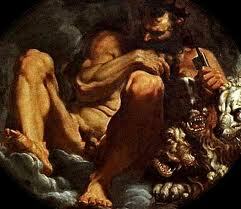 The animal was a kind of mediator between the giver and the gods. In Abydos, a part of the cemetery was set aside for dogs near the graves of women, archers and dwarves. At the height of the ancient Egyptians, collars and leashes were used by default when training a dog. Often the collars were true works of art. It was very common to engrave them with the name of the dog. Collars have been found with names like 'the brave', 'reliable', 'North Wind' and even 'useless'. Findings included also collars where the dog just got a number like 'five'. The farm dogs in ancient Greece wore collars that were very similar to the spikes studded collars that their medieval counterparts would wear. A sheepdog, which has to be white to be visible at night got a melium : a leather collar with spikes. This protected his hairy neck from the bites of a wolf as he protected the flock. 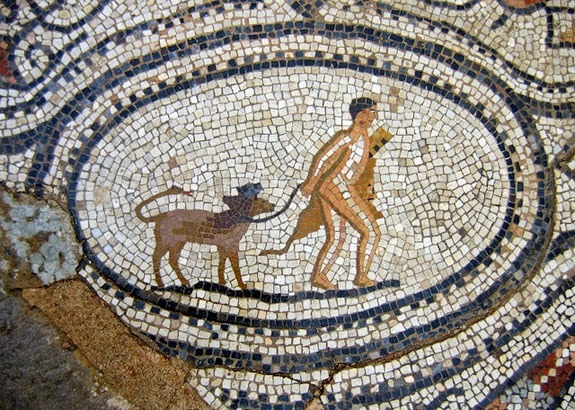 Greek farmers, like many modern dog owners, preferred the bright but not too aggressive dogs. The dogs were tough enough to attack intruders, but also kind enough to not attack their bosses. In this context it is interesting to note that farm dogs had to be black so that they could better hide unseen to surprise intruders. The ancient Greeks took care of their dogs, just like the ancient Egyptians and many civilizations after them did. In the villages, small dogs called Alopekis formed the company of women and children. The dogs were also used to monitor small herds of geese or other animals. Probably the women wore the little puppies in the sleeves of their robes as they went to the market. At that time women were not allowed to participate in social life, so the dogs must have formed very important company for women. The descendants of these dogs can still be found on the streets in modern Greek cities. Greek mythology shows great respect for the loyalty of dogs. The dog of Odysseus, Argos, waited twenty years for the return of his master while he was put outdoors because he had fleas and ticks. Because nobody recognized Odysseus on his return, he was identified by a wagging Argos, who dropped dead after it had waited twenty years for the return of his master. Even the Greek word 'cynical' originated from the word 'dog'. The original Cynic philosophers had positive and negative qualities: they lived on the streets, and were rude as dogs, but were loyal to their friends and they could easily identify enemies and deal with them. 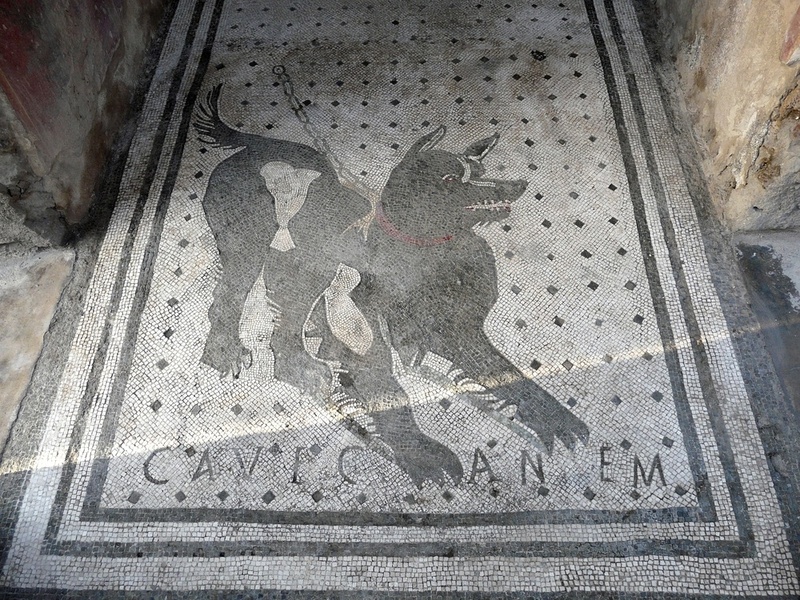 The Pompeii dog is a wonderful example of the bond between a dog and his owner. The collar has been inspected with infrared and they found an inscription that said the dog had his boss saved from an attack by wolves. The ancient Romans were so attached to their dogs that Caesar even publicly rebuked the people that they gave more attention to their dogs than to their children. 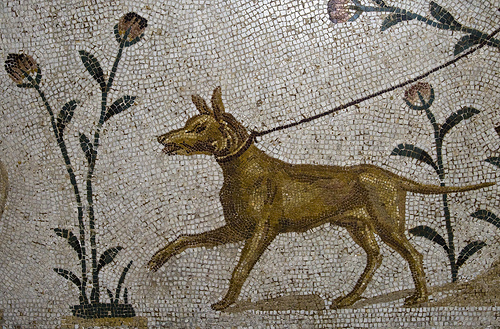 The Romans used at that time decorated collars and leashes, as can be seen on mosaics. These were scattered throughout the city in homes and public buildings. In the Middle Ages dogs were mainly used as hunters and herders. The collars were more practical and suitable for their new tasks. Simple leather was used for hunting for pigs and rabbits to identify the dog. Also a leash was attached to the dog after the hunt. During the hunt there were no leashes but sticks used to keep the dogs under control, probably because people do not want to come too close to the excited dogs. The shepherd dogs wore collars with nails to protect their necks from the wolves. This was a good use of the spikes, an invention made by the progress in metallurgy. These collars were also used during the hunting for wolves, where a dog hunted for the wolf and a battle could be expected. Some of these collars were made for adequate protection, but many dogs have lost their lives in this useless sport. After a successful hunt, the dogs were given fresh meat as a reward. The growing middle class in these times could afford dogs, and dogs were no longer a luxury property for the nobility and wealthy. Cheaper materials were used for the collars. 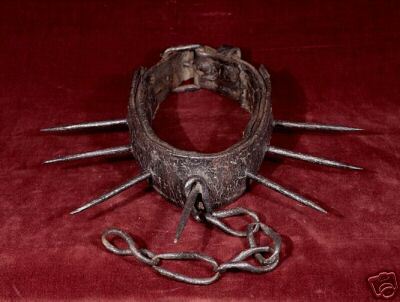 A standard collar was made of simple leather without decorations, with a ring for leash and tag . Due to the growing number of dogs a system was needed for the registration of ownership of the dog. Laws were made that arranged the ownership, also stating that an aggressive dog without registration could be slain on the spot. The upper class in the population could afford new models and materials for the collars, but that did not always benefit the dogs. The only advantage of collars was that they were protecting the throat of the dog. The collars also indicated what type of dog it was and what it was used for. Dogfights were quite normal. 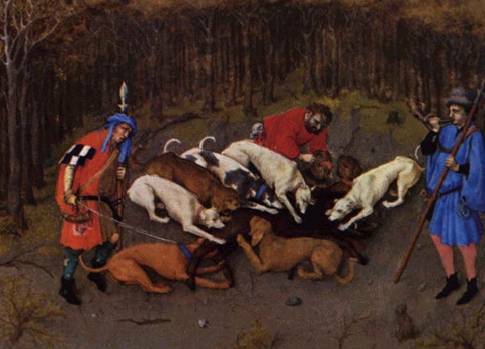 Henry VIII used his dogs even as effective but doomed soldiers in man to dog fighting. Only a Mastiff survived such a fight and was rewarded with a silver necklace. The Mastiff was a preferred watchdog for centuries. 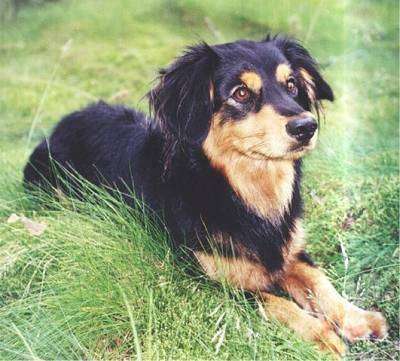 The dog is very sensitive to change, so will react agitated and bark when something happens. Although big and strong, it is a gentle giant and rarely bites intruders, and will prefer to sit on an intruder. Another development was the emergence of the collars with a padlock. They consisted of a piece of metal sometimes with rounded edges for the comfort of the dog, with a padlock. Only the owner had the key and could open it so to prove that the dog was his property. In the Renaissance, where property was very important, most dogs were treated that way. It would take centuries for the dog lover would to make his entrance. After centuries of service, the dogs were still considered a low animal and a piece of property . Although many noble men and women owned lap dogs in addition to their working dogs, the feelings about dogs certainly were not as they are today. Cruel practices such as using a dog as bait and dog fights were the order of the day. The 16th century philosopher Descartes continued this attitude, he argued that animals are a kind of machines and that their cries of pain were nothing more than the sound of a engine failure. Thanks to further scientific studies on animals counter opinions were voiced and dog could take back their place as beloved companions of humans. A grown horse or dog is a mote rational and talkative animal than a child of a day, or a week , or a month old. But suppose they were otherwise , what would it avail? The question is not, can they reason? Nor can they talk? But can they suffer? Why should the law refuse protection to all sentient beings ? This feeling was the beginning of many laws regarding the treatment of animals by both strangers and owners, and centuries came where people were very attached to their dogs . During that period, decorative collars were the norm for the dog . With new technologies, silver, gold and bronze were used in the collar, or leather that was adorned with bells. The name of the owner, not the dog's name, was engraved. In this way an owner could get his dog back! 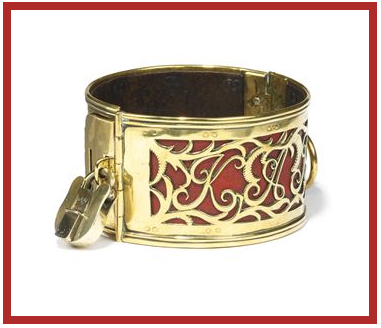 It was fashionable to engrave the collar with a witty rhyme instead of the name of the owner. Exclusive copies were made for dog shows, often the name of the owner and the dog were mentioned in the rhyme. The growing love for our dogs is not only evident from the many stories, but also from the many portraits of dogs from that time. Today, there are collars used from the birth of the dogs. 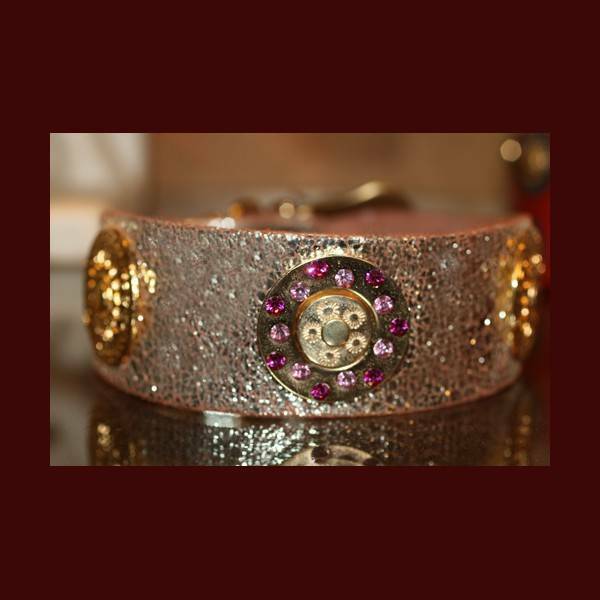 Designer dog collars are a huge market for lovers of flashy colors and expensive materials. The current culture has made us acquainted with brand collars (brands that were first associated only with products for people), Swarovski crystals and other eye-catching designs. Some owners still want their dog to work and to be obedient. The technology has several techniques to force a dog - like shock collars. Dog lovers are very divided on these methods - many find it cruel to the animal. The collars of the modern era has everything you can dream of: colors, materials, crystals, metals and creative design. But it's funny that you can find the echoes of old times in many modern fashionable collars.